Leaked photos from a recent meeting of Ford dealers in Las Vegas, US, appear to show a smaller sibling to the upcoming Bronco SUV. Also visible in the image is a shadow from a larger car, which could be that of the full-size Bronco, which Ford has previously detailed. While the smaller car, expected to arrive in 2020, will be positioned to rival such cars as the Jeep Renegade and Mazda CX-3, the larger will sit atop the four-wheel drive platform of the Ford Ranger pick-up truck in a bid to enhance its off-road credentials. Details are scarce, with no word on which components, if any, the two new models will share. It can be expected that the full-size Bronco will be more upmarket, rivalling cars such as the Audi Q7 and upcoming Mercedes-Benz GLS. Confirmed at the Detroit motor show in 2017, the future Bronco is described as a "no-compromise mid-size 4x4”, suggesting it’ll be more rugged than Ford’s current SUV offerings. Ford has previously referred to the upcoming Bronco as a global model, implying that at least one of the two models could be available outside of the US. 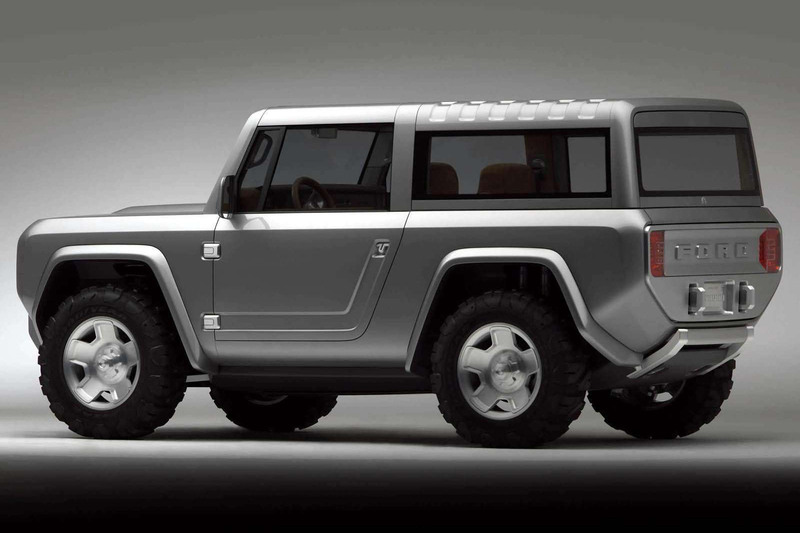 However, a Ford spokesperson has said there are currently no plans to bring the Bronco to Europe. Production for the last Bronco model ceased in 1996, 30 years after the name was introduced. The revival of the model was first confirmed with the unveiling of a concept car at the 2004 Detroit motor show. ...You better watch out, you better beware. If it's a corker, and not like these pics, JLR are going to wish they had been on the ball in releasing the new Defender. Ford ARE going to take a good portion of their sales. It's your own fault, JLR, you've taken too damn long! I think you’re right. JLR have abandoned this segment and Ford are doubling up. ...JLR are going to wish they had been on the ball in releasing the new Defender. ... It's your own fault, JLR, you've taken too damn long! Ford are hardly leading the field here, the Toyota FJ Cruiser has come and gone and while its a nice idea, the 'retro' theme is rather fickle - witness the FJ Cruiser, PT Cruiser, Prowler, last Thunderbird, Chevy SSR and HHR, the newer New Beetles don't appear as prevalent as the earlier ones and even Mini has learnt that the concept can only be taken so far. ....ones and even Mini has learnt that the concept can only be taken so far. How so? The range has been rationalised - the Coupe, Roadster and Paceman all killed off. Recent figures have been good, but then they have been across the industry. The problem for a brand like Mini is it can't stretch too far (as demonstrated by the rationalisation) meaning you can't retain customers as they grow up, marry, have families and instead have to keep attracting young ones, but newer generations don't tend to follow their predecessors. Nor can you drastically change the design and go contemporary because then you have no USP left. You can get a 3dr, 5 dr, roadster(convertible), clubman, countryman and electric Mini. (glad they dropped the Paceman). Still pretty diverse when compared to say a Corsa, Clio or 500. We should all be most grateful that all you are in charge of, is your decrepit sofa, rather than the auto industry. What is wrong with diversity, when Mini is looking to attract as many customers as possible, then possibly upsell them to a larger car range (BMW)?. TwIT, the w is silent, as you should be. Was that 2004 concept built out of Lego!